It is impossible to miss the unwittingly apt timing of Bruce Norris’ play The Low Road, a self-described ‘fable of free-market economics and cut-throat capitalism’, in the week when the death of Thatcher has led to the re-emergence of debates which have not been this prevalent or strongly waged since the years of her premiership. 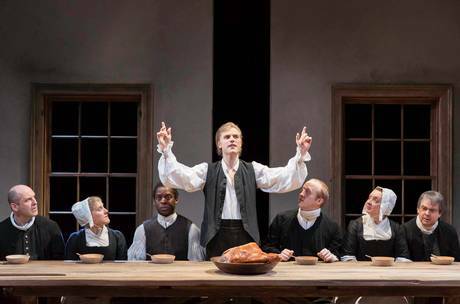 The play’s themes of individualism and community, genuine and tokenistic charity, greed, materialism and generosity are as relevant today as they were in eighteenth-century America. At the interval, I was left with the feeling that it made a refreshing change to see a new play dealing with modern issues by distancing them to a historical setting – the opposite of the current fashion to make an unnecessary relocation of a historical play to a contemporary setting with the sole purpose of ramming its ‘relevance’ down the audience’s throats. Then the second half started… and did just that, with a modern interlude as we witnessed a conference Q and A on the financial crisis. I’ll forgive Norris though as this section was one of the funniest in the play and gave the actors involved an opportunity to milk some hilarious caricatures. The whole cast was excellent, with a brave performance by Johnny Flynn as the unremittingly unlikable protagonist Jim Trumpett. Thatcher would certainly have approved of the enterprising Jim’s ability to pull himself up by his bootstraps and ensure his prosperity, even if this was at the expense of the surrogate family that had taken him in as a baby (and of almost everyone else that has the misfortune to have any dealings with him). The values of capitalism and the free market may seem unpalatable when put bluntly – and screamed at the bewildered members of the religious colony who have just rescued, fed and clothed him – but they are the values that our society is governed by. I’ve read comments criticising the play as a cheap shot against capitalism, yet narrated by Adam Smith the play sets out a scenario that could be seen to advocate it. Predictably it is Jim, with his individualistic outlook and championing of cut-throat capitalism, that prospers – and his descendents are seen to live on and thrive. The poor and the disadvantaged who find their home in the New Light of Zion Colony fail to look out for themselves – preferring to help other unfortunates – and they come to a horrible end. The play, then, merely brings out the viewer’s own opinions of capitalism. If you believe that profit justifies immorality, and that the poor, weak and idle should be left to fend for themselves, you would see vindication of your beliefs in the play’s outcome. 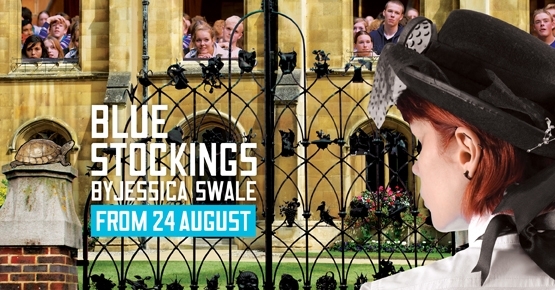 It is the sentiment of the typical Royal Court audience that allows this tongue-in-cheek, satirical look at the creation of the capitalist financial system to be a negative one. It is their sensibilities that condemn Jim for his actions, and sympathise with the kind-hearted yet naive members of the Colony. The audience laughs at the financial leaders in the Q and A, but the humour comes from accurate characterisation and the recognition of the well-worn arguments of the privileged and upwardly mobile. And Norris isn’t afraid to bite the hand that feeds him – or at least to give it a quick nip – with more than one jibe aimed at the funding of the subsidised arts. Jim’s assertion that ‘’tis and ‘twas heedless on your part to care for one [a heavily disabled community member] who could contribute so little to your livelihood’ is certainly true when applied to the Colony’s rescue of Jim, who repays their kindness with disdain, violence and theft. Yet Jim’s arrogance, pig-headedness and total lack of empathy means that he can’t see the irony of this statement in the light of his own recent predicament. 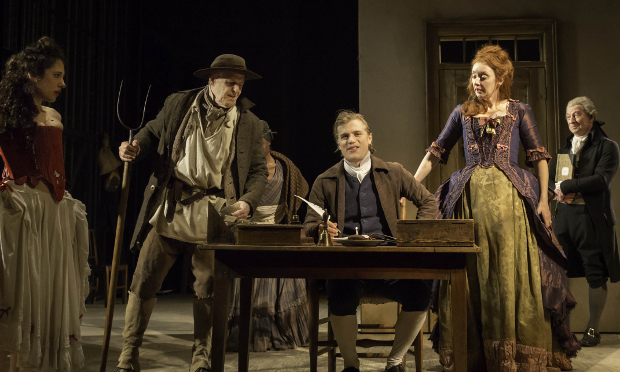 It is perhaps the play’s highlighting of the hypocrisy and double-standards of many of the proponents of a free-market economy, and the cruelty that ensues when this is rolled out to include social policy, that has riled those complaining of the play’s left-leaning attitude. That, or feeling alienated when they disagree with the pretty much unanimous reaction of the audience. Dismissing the play because you dislike its politics is a lazy critique – nobody is apolitical and criticism of capitalism is a perfectly valid stance. The Royal Court is renowned for its challenging and political new works – if you don’t want a play that challenges the status quo you might be better off seeing something less controversial like Wicked or Phantom of the Opera. Or Legally Blonde, a musical where a well-educated, attractive, mega-rich women uses her father’s money to buy her way on to an elite degree course on a whim, and overcomes the apparently disabling disadvantages of wearing pink and owning a Chihuahua to become a successful lawyer. Attorney Emmett Forrest has worked hard for years to lift himself from his humble origins but it is when he befriends the wealthy Elle and she buys him an expensive suit that he really gets taken seriously. The fact that I take exception to some of the assumptions and implied attitudes of Legally Blonde didn’t prevent me from enjoying it, and similarly The Low Road is more than just its ‘political leanings’ (although as I have already argued, they are implied rather than solidly embedded in the text). Random left-field ending aside (so random that I can’t really elaborate without it being a spoiler), this is a solid thought-provoking period drama with enduring themes – but it’s also thoroughly entertaining. Having spent the afternoon with my friend, who is studying to become a midwife, I headed off to the Royal Court to see Joe Penhall’s Birthday which details the experiences of a couple having a baby on an NHS ward. But Lisa and Ed’s is far from a normal pregnancy. As Lisa was left unable to have any more children after the difficult birth of their first son, Ed stepped up to the plate and nine months later is lying heavily pregnant in the same room that his wife had, induced and ready for a caesarean. After an impactful start, the play did seem to lose direction and at 90 minutes long sometimes seemed more like a heavily extended sketch. Yet in general Birthday remained entertaining throughout (largely due to the talented Stephen Mangan, supported by Lisa Dillon, Llewella Gideon and Louise Brealey). Mangan was utterly believable as a pregnant man going into labour, capturing the pain, frustration and humiliation of his ordeal. Dillon, meanwhile, was pitch-perfect as the partner providing ineffectual but well-meaning support while struggling to put up with Mangan’s increasingly melodramatic responses to the situation. Brealey and Gideon were also excellent as the nervy registrar and laid-back midwife respectively. Birthday perhaps plays too much on inverted gender stereotypes, although the role reversal does allow for an examination of the differing expectations of childbirth of the mother and father, that may have been less prominent if the play had featured a normal birth, and the switch is an ideal way to reveal the numerous double-standards that society takes for granted. The play also looks at the stresses that pregnancy and child-rearing put on a couple, with Mangan and Dillon making a totally believable partnership. If anything, the play brings to the fore the extent to which giving birth is a team effort, and the expectations and mutual reliance of the couple involved. I’ve never been present at a labour, but recently became familiar with the workings of the NHS while sitting for an interminably long time with a friend in A&E overnight. Waiting to be seen by a doctor, and being ignored unless facing the repetitive round of questioning from nurses every couple of hours, is enough to push anyone over the edge, and I wasn’t the one in awful pain. I’ve also heard stories from the aforementioned midwifery student, that suggest giving birth in an NHS hospital can be far from a walk in the park (not that it ever could be…) despite the best efforts of overburdened staff. The maternity hospital in the play perfectly encapsulated the NHS’ pitfalls, but clever dialogue prevents the play from becoming one long rant. Even the most routine of births is rather a dramatic occasion, and audiences are fascinated by One Born Every Minute. Yet Mark Lawson has suggested that while childbirth is “among the greatest and most important dramas of many people’s lives” it is “in theatrical terms, boring: in drama, there needs to [be] conflict, suspense, surprise”. While the gender twist in Birthday provides an element of surprise it occurs at the outset of the play. After the audience becomes used to a pregnant man, the play really becomes a straightforward look at the tensions and tribulations facing a couple going into childbirth. Penhall himself has argued that it would be impossible to find backing for a play about a heterosexual couple giving birth to a healthy child. I’m not sure if the gender-reversal is enough to overcome the problems of creating a play around the birth of a child, and this may account for the play’s lack of direction. While there are complications in Ed’s delivery, on the whole the play comprises of the waiting that forms the bulk of most deliveries. Generally, however, Penhall’s witty dialogue and the superb performance from the cast make Birthday a thoroughly entertaining look at childbirth and relationships.